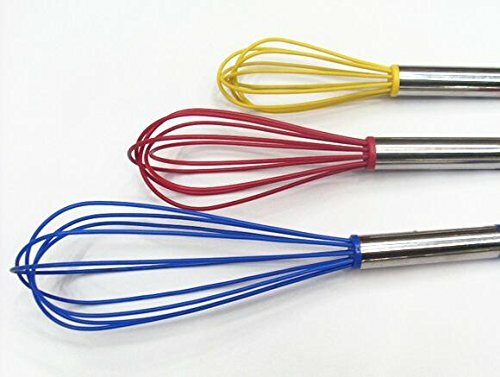 Stainless Steel Silicone Whisk Set of 3,Kitchen Utensils for Blending, Whisking, Beating, Stirring & Free Egg White Separator - Blue: 12\", Red: 10\", Green: 8\"
3 Piece Whisk Set - 8 inch, 10 inch and 12 inch, 3 sizes of whisks perfect for any of your cooking needs, flexible to use. Premium Quality - Made of food-grade silicone and stainless steel, ergonomically designed for excellent balance, the handle with hanging loop allow for easy hanging on any hook in your kitchen, easy storage. Easy To Clean - Stainless steel silicone whisk sets are strong, rust resistant, non stick and easy to clean, dishwasher safe as well. Let you always keep a pleasant mood. Beautiful and Durable - The bright colors can add superior to your kitchen and in the use of the process to keep a bright mood. Will not melt-heat resistant to withstand heat while cooking, will not scratches to your bowls, cookware. Free Egg White Separator - 304 stainless steel can be directly in contact with food, durable, handle the top of the hole to facilitate storage and save space.